Looking for AR111 LED lights? AR111 LED lights in G53, GU10 or E27 available at the best price! 2 years guarantee! Are your current AR111 too energy-consuming and are you looking for a AR111 LED? At My Planet LED, you are at the right place! At My Planet LED, you find a whole range of AR111 LED. We have AR111 LED of different types : ball lamps, round lamps, filament lamps, long lamps. At My Planet LED, you find the right AR111 LED! AR111 LED have a diameter of 111mm and work mostly with a driver. In this case, we speak of a connection G53. If your replace your current halogen lights by AR111 LED, it's recommended to replace the driver. Since the original driver has another frequention, the LED lights could start to flicker after 1 or 2 years and would become defective. Another solution would be to remove the driver and to work with AR111 LED with a GU10 fitting. The AR111 LED can also be ordered with a GU10 support. If necessary, the AR111 LED are even available with E27 fitting. Of course, you can buy your AR111 LED at My Planet LED, but there are more reasons why you should order your AR111 LED with us. With us, you order easyly and quickly your AR111 LED. Aren't you sure that the AR111 LED is suitable for your house? That's no problem because at My Planet LED, you can use our 14 days return policy. Of course, you can also count on the excellent service of My Planet LED! Would you like to have more information about a AR111 LED? Do you need more information about one particular AR111 LED? 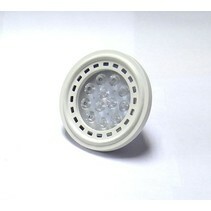 Or are you looking for a special AR111 LED which you cannot find on our led shop? Or would you like to have more information about My Planet LED? Contact us please! You can send a mail at info@myplanetled.com or call us at (+32) 57 466 866.